As a Boston-based company who works with many tech companies locally, we were curious to see how the burgeoning Boston tech industry fares when it comes to its thoughts on diversity and inclusion. 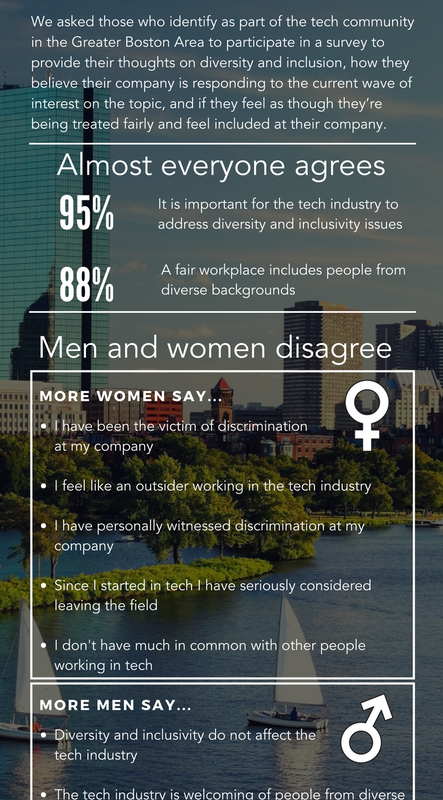 We asked those who identify as part of the tech community in the greater Boston area to participate in a survey to provide their thoughts on diversity and inclusion, how they believe their company is responding to the current wave of interest on the topic, and if they feel as though they’re being treated fairly and feel included at their company. All results were recorded anonymously unless they provided their email addresses for follow-up. Approximately 200 people participated in the survey. We learned quite a lot from this first survey, and are looking forward to revamping and releasing our next survey this fall. Note that we asked companies to complete a different diversity and inclusion survey, but our numbers were too low to provide any insights that would be significantly relevant. We will be providing those companies that participated and provided their contact information with their own report, but will be unable to share data with the general public. We will be revamping our survey and widening our scope so that we can provide the general public with those results on the company-level next year. What do the majority of respondents feel, think, or believe about diversity and inclusion? An overwhelming amount of survey respondents believe in the importance of diversity and inclusion in the workplace. The largest demographic discrepancies were found between men and women’s attitudes toward diversity and inclusion. Men appear more inclined to believe that diversity and inclusion issues are being addressed; all in all, they seem more likely to agree that the current state of things are satisfactory. 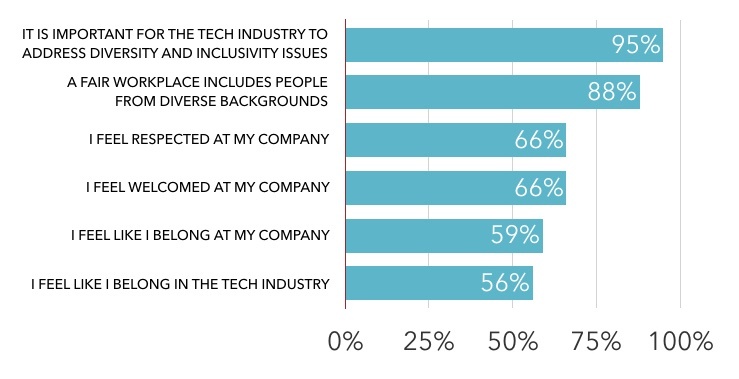 Men believe significantly more than women that diversity and inclusion do not affect the tech industry and that the industry is welcoming of people from diverse backgrounds. 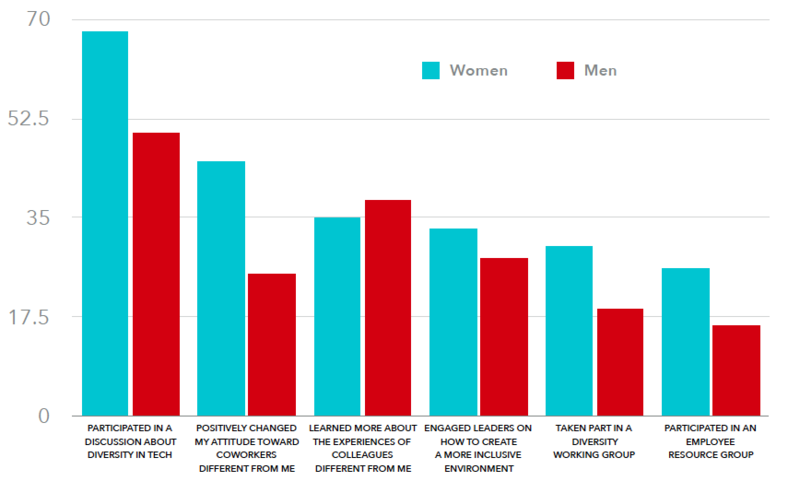 Men feel more welcomed in the tech industry and are largely satisfied with the decision-making process at their company. We also asked if their or their companies’ attitudes and actions have changed since the 2016 election. Many more people are having conversations and women appear to be more driven than men to initiate actions that reflect interest in diversity and inclusion since 2016. While we see that there is clearly an understanding that diversity and inclusion is important, the perceptions of real change are significantly different based along broad gender lines. We can surmise that these differing opinions are because men are more likely to believe we live in a meritocracy and question the idea of unconscious bias than their less privileged colleagues. The utopian ideal of meritocracy has been questioned and unconscious bias continues to be proven as reality through numerous research studies. There is a clear frustration by many who aren’t in a position of power. Many have provided tangible solutions, largely starting with leadership. So how do we move forward? How do companies start to implement some of the changes that are suggested here? How do we work with those in positions of power to provide guidance on creating and retaining a diverse workforce? We believe that the suggestions provided by respondents are excellent, but many are not easy or free, which requires a true commitment and investment by companies to make change. We wrote a post on this last year, and believe these are still great ways to move the needle.